Tender lamb is perfectly braised with onions, thyme, bay leaves and cinnamon then cooked in the oven allowing a rich depth of flavours to develop. 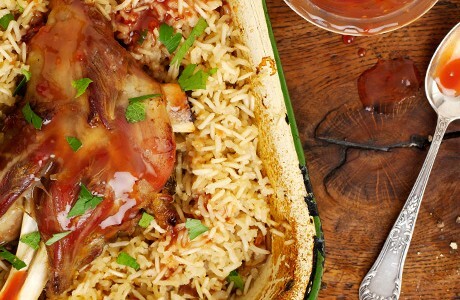 The addition of wholegrain rice ensures that this dish is as delicious as it is healthy. Add wine and reduce for 2 mins then add 1/2 the stock, cover and place in the oven to cook for 1 hour. Meanwhile soak rice for 1 hour and add to dish with remaining stock and cook for 40mins covered Heat the redcurrant jelly and mustard with a couple of tablespoons of water in a saucepan.